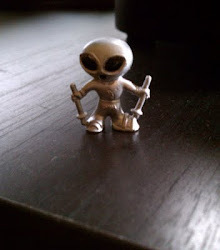 High Strangeness: The "Roswell Debate" is Coming! The "Roswell Debate" is Coming! Well, here we are, a mere 11 days before the big "Roswell Debate" between yours truly and Don "Deathbed Confession" Schmitt, and I can hardly contain my excitement! It's been almost a year now since Don challenged me to this debate after the fallout from my discovery of the sensational Roswell Post-It, and I'm sure he is ready to mete out his own brand of UFO justice. I say, bring it on, Don. 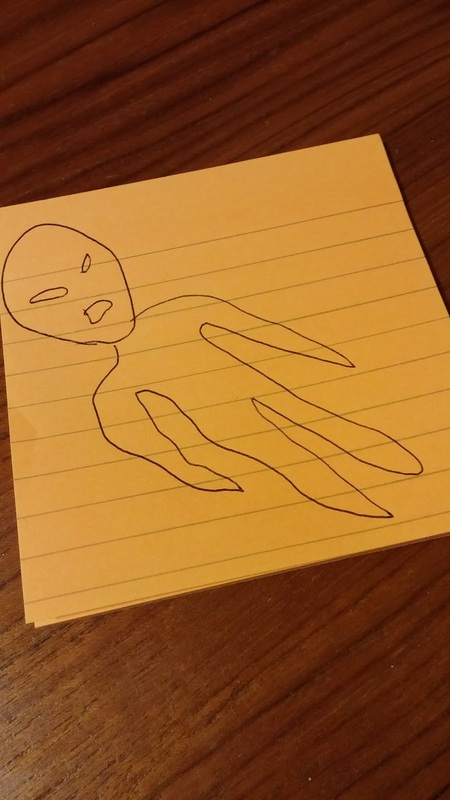 The scribble that started it all: The Roswell Post-It, discovered on my desk in 2015. The big event will take place at 3:30 p.m Saturday, October 15th, at the Milwaukee Paranormal Conference. If you want to see two middle-aged guys with great hair arguing over whether there is any proof that a flying saucer from another world crash-landed outside Roswell, New Mexico on July 2nd, 3rd, 4th, 5th, 6th, or 7th, 1947, then you've just got to be there. If you can't be there in person, I have good news: you can listen to the live webcast on KGRA Radio. At least I think you can. The truth is, I don't know any of the details of the KGRA webcast, because this dude Race Hobbs who owns KGRA hasn't communicated with me at all. I contacted him a week or two back, asking politely for the particulars of the webcast, but he has not responded. 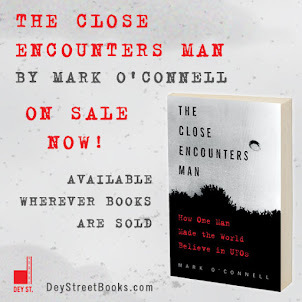 See, I thought it would be nice to fill you in on the details, and I also thought an exchange of information would be helpful to both of us, because I could put him in touch with the marketing people at HarperCollins to see if they could leverage my upcoming book, "The Close Encounters Man," to promote the debate and the webcast. But I guess Race isn't interested. Ah well, I've been in this situation before, being the guy at the UFO conference saying things that the audience and the other presenters don't necessarily want to hear. Last March, when I was a presenter at the conference in Ann Arbor, Michigan commemorating the 50th anniversary of the Dexter-Hillsdale "swamp gas" case, I questioned the conventional wisdom of that case, and said that Dr. J. Allen Hynek was right to say that the Michigan UFOs could have been swamp gas. As I was going through my analysis of the case, I sensed confusion and disappointment in the audience, and from certain of the other presenters, and it was kind of a weird dynamic. A lot of UFO enthusiasts, I realized, are more interested in validation than understanding. Fortunately, though, I got some positive feedback from several attendees, and the hosts from MUFON Michigan were fantastic from beginning to end. So, 11 days from now, I expect there could be some confused and disappointed audience members and presenters at the Roswell Debate. And if any of them want to talk after the debate, they can find me at the bar talking Bigfoot with Loren Coleman. > A lot of UFO enthusiasts, I realized, are more interested in validation than understanding. I don't think I can get past the shock! You have to try, Terry! Went to KGRA, turned it on during a discussion about the Aztec "crash" just to make sure that I did not miss it, but hoped that the debate would reward me. It was not to be, as they aired something else. Perhaps someone will post it elsewhere.